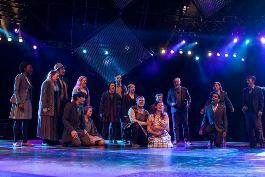 Commissioned Limited with Love Beyond, a new musical, playing for two special performances only on 1st and 2nd October 2014 at The SSE Arena, Wembley. Powerful and uplifting, Love Beyond is a unique presentation of the greatest love story ever told, unfolding the entire story of the Bible as never before. A contemporary production, this epic musical re-tells the inspiring stories of lives touched by God, from Genesis to Revelation and puts the focus on their significance to mankind today. Love Beyond promises a sensational production with a host of West End stars, accompanied by one of the biggest live orchestras of any musical theatre show in London, playing a dramatic and original brand new score. The London cast of 29 will be led by musical theatre legend, Dave Willetts in the role of ‘Father God’. Dave was the first person in the world to have played the leading roles in the two most successful shows of recent times, Les Misérables and Phantom of the Opera as ‘Jean Valjean’ and ‘Phantom’ respectively. He has also starred in a host of West End hit musicals including Cats, Jesus Christ Superstar, Sunset Boulevard, 42 Street and Aspects of Love. The Son of God ‘Jesus’ will be played by Paul Ayres (Rent, Ghost). Alongside Dave Willetts and Paul Ayres are a talented cast of actors, singers and dancers including Dougie Carter and Joe Evans (Les Misérables) J Marie Cooper (Mentored by Will.i.am in The Voice 2013) Holly-Anna Lloyd (Berlin – The Musical) Kevin Jones (Les Misérables In Concert) and Joseph Claus (Phantom Of The Opera). Love Beyond has music and lyrics by Richard Haley and Tabitha Webb, set design by Sean Cavanagh (Dreamboats and Petticoats, Rat Pack – Live from Las Vegas, Joseph and the Amazing Technicolor Dreamcoat, all West End), sound design by Mark Payne (The Matrix Live, Cinderella on Ice, Swan Lake on Ice), lighting design by Ben Cracknell (Classical Brit and Olivier Awards, Our House on tour) and Musical Direction by Stuart Morley (We Will Rock You). The show is directed by West End leading lady Tabitha Webb, who has played ‘Christine’ in The Phantom of the Opera and ‘Cosette’ in Les Misérables, with choreography by Annette Aubrey-Bradshaw, founder member, an Artistic Director and choreographer at Pneumata. Full casting: Dave Willetts ‘Father God’, Paul Ayres, Clyde Melville-Bain ‘Holy Spirit’, Dougie Carter ‘Adam’, Natalie Lipin ‘Eve’, Peri Olufunwa ‘Satan’, Holly-Anna Lloyd ‘Mary Mother’, Joe Evans ‘Joseph’, J Marie Cooper ‘Mary Magdalene’, Kevin Jones ‘Paul’, Constantine Andronikou ‘Zacchaeus’. Feature ensemble: Kathryn Aiken, Irene Alano, Rosemary Annabella, Piers Bate, Joseph Claus, Jamie Cloutier, Sheri Copeland, Kimberley Davis, Sarah Hooper, Benjamin Isaacs, Matt Kane, Jessica Louise Parkinson, Simeon Oakes, Hannah Prentice, Matthew Rutherford, Sarah Seaman, Luke Simnett, Darren Street.